Many times an injury will require the need for a compression bandage. These injuries can be as simple as a sprained wrist or ankle which would require the joint to be immobilized or something as complicated as lymphedema therapy. The identification of which type of compression dressing to use is important in order to facilitate quick healing and prevent pain, infection, or even autonomic dysreflexia. Even though all compression bandages do basically the same thing, there are subtle differences that make one type of bandage preferable over another. Lymphedema is a condition of localized fluid retention due to a compromised lymphatic system and leads to tissue swelling. Lymphedema can be hereditary or a result of a damaged lymphatic system due to cancer treatments. The condition is treated by manual compression lymphatic massage and compression garments or bandaging. A certified lymphedema therapist will use a series of elastic bandages to reduce the swelling and help the circulation of built-up fluid throughout the body. Long stretch bandages have long stretching properties. This means their compressive properties can be adjusted easily. These bandages have a high resting pressure, therefore should be removed at night or while at rest. 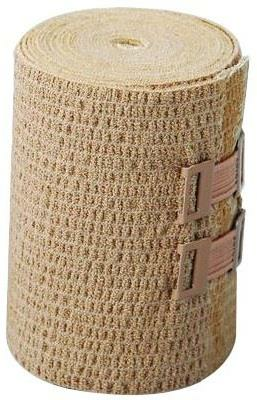 This type of bandage is usually made from elastic (latex or latex free) and utilizes either a metal clip or a Velcro method to secure it after wrapping it around the injured area. These are commonly known as ace bandages and come in a variety of widths, making it simple to choose depending on the area affected. Long stretch elastic bandages can be used for a variety of injuries, either immobilizing a joint (such as an elbow, knee, ankle, or wrist) or applying compression to a pulled muscle usually related to the athletic activity. Some incorporate an antimicrobial material while others are washable for sanitary reasons. Short stretch bandages are minimally elastic. They provide high working pressures and lower resting pressures. They are used to control swelling in limbs. This kind of bandage puts pressure on the skin and muscles to improve absorption of fluids. As opposed to long stretch bandages, short stretch bandaging technique provides a massaging effect on muscles. Usually, these bandages are rated at around 70%, meaning they stretch only about 70% of their length. Short stretch bandages are often used as one layer in a system of three or four layers for compression treatment in patients with chronic swelling, such as lymphedema or venous ulcers. Some common brands are Comprilan, Rosidal, and Isoband. These bandages are washable so they can be used more than once. Multi layer compression wraps utilize a series of bandages for protection and compression predominately in the treatment of venous ulcers. For example, the Profore multilayer system utilizes four different bandages, a padding bandage, a conformable dressing, a compression bandage, and a cohesive bandage. These all work together to facilitate a proper healing environment. These elastic layers achieve a sustained level of compression over time. Adds absorbency. Smooths orthopedic wool. 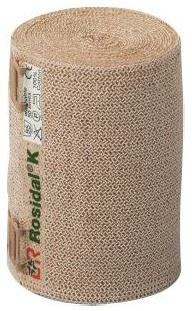 When treating ulcerated wounds on the legs, a patient may opt to use Unna boot bandages. Named after German dermatologist Dr. Paul Gerson Unna, this type of bandage made of cotton cloth and a paste made of zinc oxide with calamine and glycerin under certain circumstances. It’s similar to the way plaster is utilized in a hard cast but doesn’t harden. This bandage works as a barrier to keep patients from scratching ulcerated wounds and prevents infection. The boot usually extends from the toes to just below the knee, and when the zinc oxide dries an elastic band is wrapped around the boot to maintain pressure on the foot and leg. The Unna boot should be replaced every week or so until the ulcer has healed. Since the link oxide does not cake or dry out, this type of bandage and stay on longer than other methods. Most patients treated with an Unna boot are ambulatory, wheelchair or bedridden patients are treated with other methods. Some brands patients might consider are Dynarex, Dumex/Derma Sciences, Convatec, or Covidien.